Steve Webster isn’t real sure how they came to have the letter. Dr. Steven Webster is Director of Education emeritus at the Monterey Bay Aquarium. The letter is from the superintendent of the Steinhart Aquarium in San Francisco. It’s addressed to Mr. K. Hovden, owner of the largest cannery in Monterey. Knute Hovden must have been pleased with the letter’s contents. He had often thought that an Aquarium on Ocean View Boulevard might prove to be a successful venture. He was obviously aware of the marine biological wonders of Monterey Bay. Now, here was the man who operated the San Francisco Aquarium telling him he was right. It was indeed a good idea. The letter is dated November 12, 1925. Hovden must have had more pressing things on his mind. The letter was simply filed. Nothing was done about the aquarium idea. Monterey was on the way to becoming the Sardine Capitol of the World; and for the Hovden Cannery – business was good. 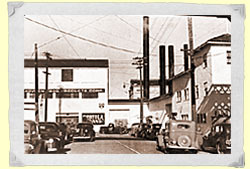 A few years later, a marine biologist named Edward F. Ricketts moved his business (Pacific Biological Laboratory) a few doors down the street from the Hovden Cannery. Pacific Biological’s business was the gathering of specimens for use in high school and college biology classes. He was well known at Stanford’s Hopkins Marine Station located just up the shore from Cannery Row. Ricketts was also working on a text book for students interested in coastal tide zones. Between Pacific Tides – now in its 6th printing – is the largest selling text book in the history of Stanford University Press. This is an irony because when he was writing his now famous text – Ricketts was regarded by Stanford scientists as sort of a scientific lunatic. He insisted upon studying organisms in relation to their environment. A starfish was not just a starfish. It was an entity in an overall inter-related universe. He was actually an ecologist and environmentalist who was out of step with his time – because he was decades ahead of it. Several years later, Ricketts collaborated on another book. This time with his friend – John Steinbeck. They had gone on a now famous expedition, aboard a sardine fishing boat called The Western Flyer, to collect biological specimens in the gulf of California. And so, it seems Steinbeck and Ricketts were very aware of the the benefits that could be derived as a result of keeping and observing marine life in an aquarium. Remember also, that Ed Ricketts’s lab was but a few doors down the street from the Hovden Cannery. Sea of Cortez was first published in 1941 – sixteen years after the letter to Mr. Hovden about his Aquarium idea. In 1945, Steinbeck published another book. He dedicated it to his friend – saying: “For Ed – who knows why or should.” Cannery Row changed Ricketts’ life. 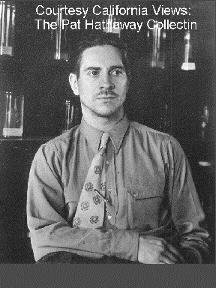 The world now knew him as “Doc.” He and his lab became world famous. At the same time, an era was ending. Then, around 1970, Steve Webster and a few others were working at Hopkins Marine Station. The group frequently discussed what might be done with the old empty Hovden cannery building around the corner. Someone said the word “Aquarium” – and they’ve been saying it ever since. Steve Webster describes the organizing committee as a sort of “gang of five.” Two of them were daughters of David Packard – one of the wealthiest men in America. The David and Lucille Packard Foundation received a grant request. The good idea’s time had come! The idea that was spawned nearly 50 years earlier by the man who owned the building on the very site that now houses the Monterey Bay Aquarium. It is a world class facility that attracts millions of visitors. MBARI (the Monterey Bay Research Institute) is the research arm of the Aquarium. It is researching the Monterey Canyon (twice as deep as the Grand Canyon) with the help of a $16 million research vessel known as The Western Flyer!